Synopsis (from Amazon): Five college friends, three men and two women, have been getting together every Thursday night to share humble meals and an abundance of laughter. 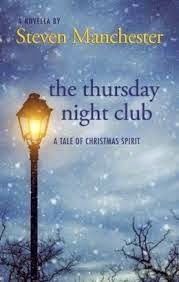 But when tragedy takes one of them, leaving the others to question the fairness of life, the Thursday Night Club decides to embark on a contest in the memory of the generous spirit of their fallen brother. The objective of the contest is simple: whoever performs the kindest deed by Christmas night wins the pot – four quarters. And there are only two conditions: the benevolent deed must be anonymous, and it cannot cost a single penny to pull off. One (or more) Sentence Summary: What a great story and beautifully written. A positive novel is so many ways. A refreshing story about four college students that do amazing things in the memory of their friend who was tragically taken from them. Favorite Character(s): All of them are my favorite characters. I really can't just pick one as they are so special in their own way and do so much good. Fast read/slow read: Very fast. Cover: So calming and perfect. Would I Read Other Books by the Author: Absolutely. Steven Manchester reminds me of a Richard Paul Evans - feel good books, with positive messages, and leaves you wanting more. Steven Manchester is the author of the #1 bestsellers Twelve Months and The Rockin’ Chair and the novelsGoodnight, Brian and Pressed Pennies. His work has appeared on NBC’s Today Show, CBS’s The Early Show, CNN’s American Morning, and BET’s Nightly News. Recently, three of Manchester’s short stories were selected 101 Best” for the Chicken Soup for the Soul series.